Achievement Week is held twice a year in preparation for Fall and Spring student recitals. Each student will prepare with their teacher, scales, an etude and recital repertoire to then be performed in front of a faculty panel (Jury) at the student’s regularly scheduled lesson time during Achievement Week. Each student will receive a certificate of achievement, and positive, constructive feedback from the faculty panel. Many of our Faculty at SMCM are members of the Music Teachers’ Association of California (MTAC). It sponsors the music study program Certificate of Merit (CM). 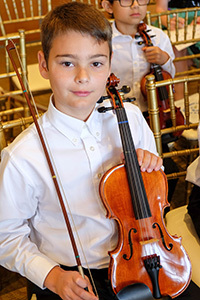 The program provides a standard of curriculum that requires students to strive for focused musical excellence in performance, technique, ear training, sight reading/singing, and music theory. This annual statewide program involves approximately 30,000 students in piano, violin, cello, viola, flute, French horn, oboe, clarinet, saxophone, bassoon, baritone/euphonium horn, voice, and harp. Students benefit tremendously from this educational opportunity. Please consult with your child’s teacher for more information regarding registration and preparation.